Copper alloys are valuable to a variety of industries, and boast myriad uses. This reddish-brown metal tends to have high conductivity of both heat and electricity, and has many purposes from medical devices and computer components to electronics and construction. However, pure copper, or Cu on the periodic table, tends to be a softer element like its precious metal cousins, silver and gold. As a result, this makes pure copper difficult or impossible to work with for the many industries that require it, which brings us to the creation of copper alloys. Both today and over the course of history, pure copper has often been combined with other stabilizing elements such as nickel, tin and zinc to strengthen it and to provide other additional properties that are not available from copper alone. When copper is mixed with any other element, these materials are known as copper alloys. Alloys are materials made of two or more metals or a metal and non-metal, which usually gives the newly created material some sort of useful property that it may not have had as a pure element by itself. There are two types of alloys: wrought alloys, which are forged or hammered, and cast alloys, where the materials are molten down and then hardened into the desired shape. In the case of copper alloys, these different metals often retain the conductivity of pure copper while helping increase the material’s resistance against corrosion and the overall strength of the material. This practice has been used for centuries, most notably in the Bronze Age, which occurred between 3,200 B.C. and 600 B.C. throughout Europe and parts of Asia where humans used these alloys for a variety of tools, ornamental pieces and other various materials. There are over approximately 400 different types of copper alloys, and they are grouped into various classes. These classes are categorized based on the principal alloying element that is merged with the copper, whether it is zinc, tin, aluminum, silicon or nickel. The most common copper alloys are brasses and bronzes, although there are plenty of other copper alloys that have a variety of practical purposes in a multitude of industries. Brass, which is mainly copper alloyed with zinc, comes in a variety of hues and has approximately 23 to 44 percent of the heat conductivity of pure copper. It also retains the antimicrobial properties of copper ore, causing pathogens to die upon contact, which makes it a particularly desirable material in the medical industry, specifically for medical devices. One of the appealing attributes of brass is that it can be formulated to turn a variety of different colors, ranging from bright silver to dark chocolate brown, which makes it aesthetically pleasing in design applications. There are several different types of "bronzes" that in actuality are brass, such as manganese and architectural bronze, as they are also mainly made up of zinc like other varieties of brass. Aside from medical, other uses for brass include cartridges, electrical lining and cooling materials. Bronzes combine copper with a variety of elements. They come in several different forms, depending on what type of metal is predominantly alloyed with copper. As a result, each type of bronze is used for a different purpose. For example, tin bronze alloys, also known as standard bronze, are more corrosion resistant and stronger than straight copper with low friction resistances. Phosphor bronze also contains tin, which allows it to retain many of the properties of straight tin bronze, but also contains phosphorus to help in maintaining fluidity in casting. These types of bronzes are the most common alloys found in artifacts from the Bronze Age, as well as in more modern usages such as springs, gears and load-bearing components. Aluminum bronze, which contains 5 to 12 percent aluminum instead of tin, can also contain additions of iron, nickel, manganese and silicon. The inclusion of these elements means that aluminum bronze alloys are stronger and resist deterioration from outside elements such as sulfur better than brass or straight tin bronzes. It also retains a beautiful golden color, is biostatic, and is more corrosion-resistant with very little tarnishing. As a result, this type of metal is typically used in pipes, particularly in seawater. However, these same properties make it a very difficult alloy to cast and manipulate. Silicon bronze is approximately 96 percent pure copper while featuring silicon prominently, although it can also contain manganese, tin, iron or zinc. This type of alloy is easily welded, has a good surface finish, resists corrosion in contact with liquids and chemicals, and remains strong yet ductile. Since it is the easiest to work with of all the copper alloys available, this is the type of bronze that artists often choose to for sculpting. However, it also has plenty of common architectural uses, such as window frames, hinges, railings, and fasteners. It also possesses high electrical conductivity, so it is employed for wires as well as in aerospace applications. There are several different types of copper alloys that do not fall under either the bronze or brass categories. Copper-nickel, also known as cupronickel, may be common in coins but is also considered a particularly important alloy that fights against biofouling, which makes its usage especially appropriate in sea vessels and other underwater operations. Nickel silver is actually a copper-dominant alloy and combines copper with nickel and zinc for coins, cutlery, car radiators, plumbing, marine applications, and even musical instruments. The strongest copper alloy, though, is beryllium copper, which is similar in strength to alloy steels but has better corrosion resistance and more conductivity in both heat and electrical applications. Since it has no magnetic properties and is unable to spark, it is commonly used in mining, gas, petroleum and other hazardous environments to create tools and piping. However, it is a rather expensive copper alloy to obtain and its fumes can be hazardous to inhale while it’s being forged, so very few industries actually employ it and opt for more inexpensive alloys. 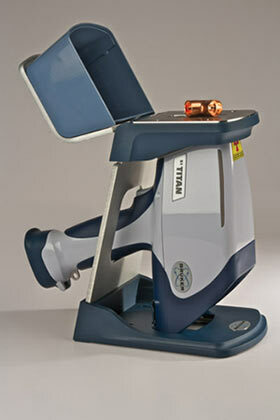 Copper composition can be obtained by using a Copper Tester to identify the materials that make up the alloy. Alloy testing is important for a lot of industries, as the alloy grade needs to be determined before procuring the metal for use in industry. Depending on the industry, certain standards have to be met in order for an alloy to be up to spec for its particular use. Material mix-ups and out-of-spec alloys can be costly and dangerous, putting lives, time, profits, and reputations at risk. The wrong grade of alloy in a product ranging from consumer electronics, automotive and even aerospace can put people, companies and industries in danger, as the component may lack the properties necessary to withstand the stresses to which it will be subjected. Such materials mix-ups can potentially cause fatal component errors, resulting in serious problems in the final product. If the product goes to market using the out of spec alloy, the material could break or possibly put consumers in danger if it is not capable of performing or holding up to what the application requires. In the past, copper alloy testing was often performed using wet chemical methods, such as volumetric and gravimetric wet chemistry. However, this quantitative analysis method often means destroying the alloy by exposing or submerging it in chemicals in order to test it. This is less effective, as exposing the alloy to various substances and even changing its structure could possibly change the overall chemical composition of the alloy, meaning the test would not be as accurate as leaving it in its formed state. It also presents a problem in the case of many copper alloys, like copper-nickel and certain brasses and bronzes, as they are highly resistant to corrosion and dissolving. This is what makes them effective as materials for industrial use, but not easy to analyze using wet methods. In some copper alloy testing, like for archeological artifacts, this type of testing can not be used at all. The Bruker TITAN Handheld XRF allows the material to remain intact for testing and provides results in seconds, making sure it’s both quick and non-destructive. Many metal alloys, including copper alloys, can be analyzed using handheld XRF with very little effort. Also, since the Bruker TITAN Handheld XRF is a handheld technology, it’s much easier to use in analyzing a material at various stages from fabrication to final product to in-service components and in place rather than preparing a sample and sending it to a lab. The Bruker Handheld XRF has multiple uses when it comes to copper alloys, ranging from scrap analysis to archeological and historical purposes to a variety of lucrative industries that need to make sure the materials they’re working with are in compliance with specs and standards. Due to the destructive nature of wet chemistry analysis techniques, the compositions of the bronzes used in many artifacts from around the world was not available, and the alloys used during the Bronze Age couldn’t be tracked geographically or over a historical period of time. When it comes to working with brass and bronze, handheld XRF offers plenty of simplicity and speed because you can bring the analyzer to the sample instead of transporting the samples to a lab. 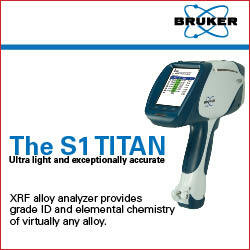 Although a lot can be determined about the general composition of any brass or bronze based on its coloring, the Bruker TITAN Handheld XRF gives detailed elemental composition information, down to ppm levels when necessary, that is necessary QA/QC throughout the alloy lifecycle. Having precise composition of an alloy at the touch of a button allows fabricators, end users, recyclers, etc. to quickly and efficiently determine that the samples in question are in spec, check for unwanted tramp elements, avoid materials mix-ups, and conduct PMI. When working with copper alloys during the manufacturing process, one of the most important issues is keeping track of chemical composition and labeling the material appropriately. The balance of copper with other elements will dictate not only the monetary value of the alloy, but also its strength, usage and effectiveness for the job it is intended to do. For example, in copper-nickel, there are two ratios that are used: 70/30, which contains 70 percent copper to 30 percent nickel, and 90/10, which contains 90 percent copper and 10 percent nickel. The 90/10 is often cheaper to produce than the 70/30, so it is often chosen to be used in more applications than other copper alloys. However, there are times where 70/30 is preferred, and it is important to make sure that the composition is accurate and appropriately labeled so as not to be mixed up with 90/10 as it ships to the customer. There are numbering conventions throughout the world that provide an orderly method for identifying various copper alloys based on their chemical composition. These are specifications with identifying numbers to help guide those in industry to be sure they use the proper grade of material for their specific applications. In North America, there is the United Numbering System, which starts with the prefix C for copper and continues with a five-digit number. Those that are wrought alloys are given the numbers C10000 to C79999, while cast alloys are C80000 to C99999. In Europe, the EN standards provide a similar identification system. Usually after forging, the alloys will be marked with its number as to better indicate to users what material they are working with. There are very important specification that most alloys have to meet in order to be used for certain purposes. This means they have to have certain ratios of some elements and other trace elements have to be removed entirely in order to fit industry specifications. These trace elements are often called "tramp" elements, and in brass scrap, there are penalties for the amount of lead, iron, aluminum and silicon in each alloy that exceeds the allotted amount of tramp elements. Another important factor in any copper alloy testing with XRF is to measure the amount of potentially toxic materials that might be in an alloy used for water supply or plumbing. Copper plumbing is not constructed of pure copper; rather, it is a brass alloy, and throughout history there have been issues of lead, also known as Pb, permeating into drinking water and poisoning people. Lead in drinking water is very dangerous, and as a result, the Safe Water Drinking Act of 1986 offers specific instructions regarding copper plumbing. All copper plumbing must contain less than 0.25 percent of lead in order to remain compliant with the national standard. Copper mining operations, scrap recyclers, environmental engineers and copper alloy fabricators can all use the Bruker Handheld XRF to identify the amount of copper in materials as well as obtain grade identification of copper alloys. It is incredibly easy and straightforward to operate and interpret, so practically any person can take advantage of the immediate results and not have to worry about wasting time and money preparing and sending materials to a lab which in many applications is entirely impossible. Contact Bruker for more information on the Bruker Handheld XRF for determining copper composition in copper alloys.